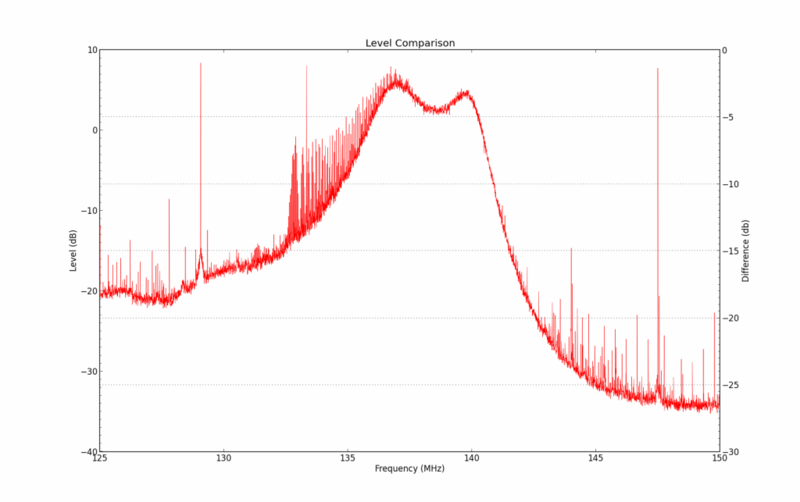 Lacking both an expensive signal generator and spectrum analyzer, Hans used his RTL-SDR together with a simple diode based wideband noise generator to measure the frequency response of a 137 MHz bandpass filter. To do this he used the RTL-SDR Scanner software which allows you to create a composite spectrum over a frequency range wider than the maximum 3.2 MHz of bandwidth the RTL-SDR provides. 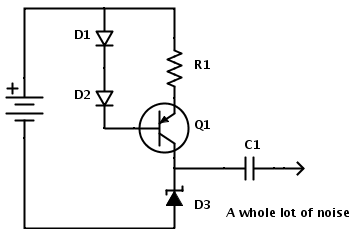 The wideband noise generator was cleverly constructed out of a diode operating in it’s reverse breakdown mode. Apart from the obvious excessive spurs, this method worked quite well and the shape of the filter is clearly visible. I think BeardieBob is right. YOUR drawing is missing a 10K-100K ‘R2’ between the Base and -. His LATTER TWO comments are also correct. I really liked this item. I cannot afford a spectrum analyser and I only need simple measures. However, the original site of Hans at hansvi.be now has a correction to the noise generator schematic. You may like to update your page here. Do keep on going. Your whole website is superb.